This is one of those times when I enjoy coincidences. I have been listening to the Shift & Steer podcast through iTunes. One of the presenters is Aaron Hagar who has some good genes: Sammy is his dad, a rocker and known car nut. In flipping through some of my old podcast contents I came across one about Tanom Motors – and there was Sammy Hagar providing input to their cars! 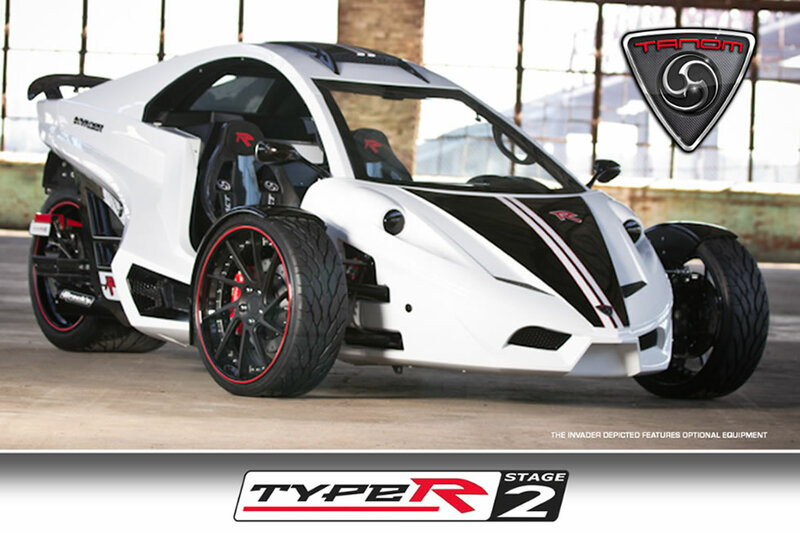 The Invader TC-3 Coupe is the “base” model and is a two seater with a roof (no doors though), two 18″ wheels up front with a massive 20×16″ wheel at the back! In-between, and powering the car, is a Suzuki Hayabusa 1300cc mated to (I think) the original bike gearbox – it is certainly chain driven to that enormous rear tyre! The 190hp motor and 700kg weight provides for fast acceleration: 0-60 mph in 3.5 seconds and it is certainly compact and should be a rocket. Top speed is up to 160mph, this all depends on the gear ratios purchased! Then there is the TC-3 Red Rocker (this is where Mr. Hagar comes in). What do you get extra? His choice of glorious Red with chrome wheels, premium audio (as you would expect from a rockstar) and other technologies. But wait there’s more …. you also get a box of Sammy Hagar CDs, a Les Paul Guitar and a signed badge for the car! For the more adventurous, there is also the TR-3 Roadster without the canopy, however, if you are up for more fun (aka speed) then you could get the Type-R Stage 1 or Stage 2 both of which have uprated power, steering, brakes and suspension units. As you can imagine Stage 2 is more focused than Stage 1! Over the years there have been several sports cars that have used motorbike engines and the Hayabusa engine is a great one to use. It is a 16 valve, 4 cylinder motor with double overhead cams and fuel injection. In its original form it produced around 170hp although I’m sure that was mid range – the bike, at 260kg, is capable of 180+ mph, so they probably put some limits in it! The Invaders aren’t cheap – however the smile per mile must be huge. I have to get back to the US and get my hands on one…. All images are owned by Tanom Motors. First Published: 23rd October 2015. Updated: 12th March 2018. Yes, you do need that whole thing for the link to work – obviously websites are not an interest – as soon as they can see the pics they are done, bad luck for the details! Lovely, but how about writing about the Spartan? Being produced locally by a couple of Ducati nutters. See http://spartanmotorcompany.com/www.spartanmotorcompany.com/History.html. Oops, it turns out they abandoned the 1198S version in favour of a Honda.. Oh well, you get that! They brought it along to the DOCNSW Concourse De Elegance on 18/09/11 with the Duke donc in it. Looked pretty good back then, but seems it has taken ’til now to get the thing into production. Go get us a story on that one please? You can see their earlier story here: http://hunterdog.org.au/DiscussionBoard/index.php?topic=773 which I have just gone and added some pics to – feel free to copy them as you will for any such article.